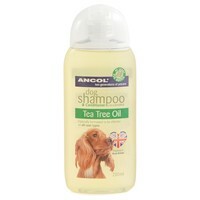 Ancol Tea Tree Oil Shampoo 200ml is a fantastic shampoo and conditioner that will leave your dog's coat beautifully soft and clean. Formulated with 1% pure tea tree oil, this great shampoo cleans using the biocidal properties of tea tree for a hygienically clean coat. Great for dogs with dry or itchy skin, this tea tree shampoo is perfect for all coat types. Concentrated solution for even more washes!